We are proud recipients of Algonquin Region's Award of Excellence 3 Years Running! Each booking comes complete with an UNLIMITED Algonquin Pass which also gains access to Arrowhead Provincial Park located just 16 minutes away!! Free entrance with your complimentary pass. Blue Heron amenities include a romantic wood burning fireplace and complimentary canoe from Spring to Fall and 2 pairs of high tech snowshoes during the snowy season. We are conveniently located on year-round serviced roadways. Our flat level driveway has lots of parking space - NO hills to negotiate! Bring your pet free! Your concierges are empty-nesters who quietly reside in upper level when we are not travelling. 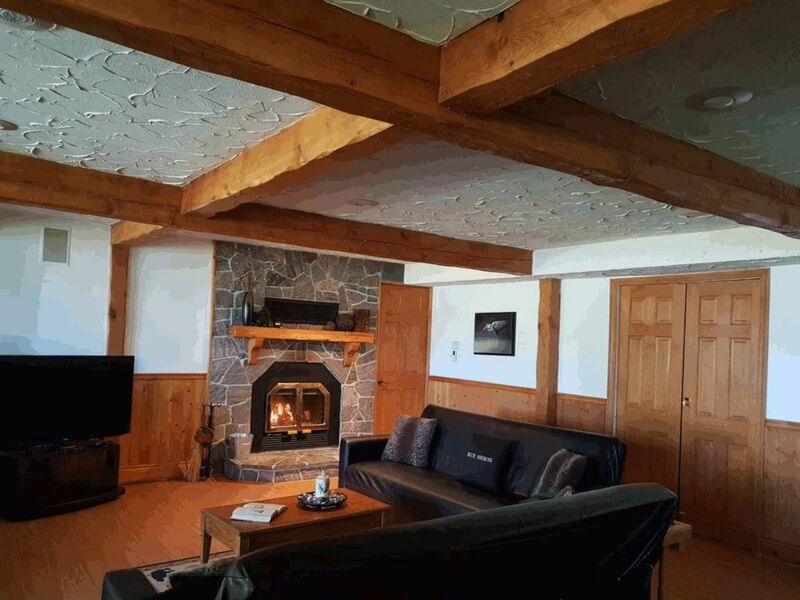 We converted a large four bedroom log cottage into a fully self contained independent vacation apartment and proud to achieve Award of Excellence status in the Algonquin Region three years running! Our guests enjoy full privacy throughout the grounds including beach, deck, treehouse, firepit, etc. Other than an optional brief orientation at arrival you will not see anyone unless you specific request assistance. As you can see from all our five star reviews, we are just a text or phone call away from any concierge services tips on what to see and do in the area. We offer the option of a self check in/check-out and provide personal electronic lock access to entrance, especially convenient for those arriving late at night. We leave out a welcome binder for easy reference on the cottage and activities in the area. For those that need to keep connected , you would have full access to WiFi internet . For quieter moments Blue Heron includes a variety of board games, a wide selection of reading material, or enjoy watching Netflix or DVD's on our 51'' flat screen TV and blu-ray soundbar! Propane infra-red BBQ on site. Seasonally we supply a complimentary canoe from early Spring to late Fall and provide 2 pairs of hightech snowshoes during the snow months. All bookings include an UNLIMITED Algonquin Park Pass with every booking. The Blue Heron is a naturalist delight - explore a waterfall in Algonquin Park, track a deer print, visit a historical sites, or simply 'Kick Back' and enjoy the natural beauty of a sunset overlooking serene Walker Lake in our new Muskoka chairs! . During your stay you can choose from so much of what Muskoka has to offer. We are close enough to all the attractions such as golfing, skiing, restaurants, and yet far removed from the hustle and bustle of modern day living! It’s perfect for both the young and old alike; whether you are traveling on business, vacationing with a young family, or escaping for a romantic getaway , the extra spacious setting accommodates everyone . . . we even offer specials for long term rentals. The Blue Heron is a naturalist delight - explore a waterfall in Algonquin Park, track a deer print, visit a historical sites, or simply 'Kick Back' and enjoy the natural beauty of a sunset overlooking serene Walker Lake on a canoe or snowshoe :). Meet the majestic, green giants of the forest -- in this on site walk and talk, we will learn their significant role in the local ecosystem as well as their gifts to human culture as food, medicine & tools. In the context of the last glacial movement, we will read the local landscape to tell the story of its past. Plants and trees speak to us all the time - through a secret language. Magically, it is the same language as art. Through drawing and painting we will learn how to decode this secret language to discover who they are and what they are saying. You can bring the practise home with your own field journal and plant identification kit. Based on the ancient teachings of "the Sacred Five," we will explore the empowering ways to feel and live more "at home" in the wilderness. Susan and Dennis are empty nesters who in 2010 converted their log cottage into private self catering executive vacation lakefront accommodation which walks out to beautiful Walker Lake. The Caracciolo's are very service based, so travellers needing any assistance / travel information, or perhaps a forgotten a item, they will be only pleased to a assist! Most popular features: This child and pet friendly property has its own tree house, playground swing set, basketball net, paddle boat, and the upper deck which overlooks the western sunsets. We feel in love with Muskoka in its vast 2,500 square miles of stunning pine and maple forests, 1,600 sparkling lakes, magnificent waterfalls, granite cliffs, and the most breathtaking scenery in the province. Flanked on the north by Algonquin Provincial Park, Muskoka is known for its extraordinary beauty and tranquility. Many artists, sculptors, and writers are inspired by the magnificent and natural setting, lending the Muskoka area an artsy edge that further attracts visitors and cottagers alike! Muskoka is a year-round region. During the fall, Muskoka is transformed into an artist's palette of breathtaking colours. Winter offers an icy wonderland of fabulous snow activities including hiking, snowshoeing, skiing, skating, sledding, ice fishing, and more. With Spring comes the return of the mesmerizing calls of the loons, welcoming guests and the exciting summer activities just around the corner. There is so much to explore and be enriched with the area's exciting culture: A very popular stop inside the park is Algonquin Art Centre & Gallery showcasing some of Canada's foremost wilderness and wildlife artists There are many distinctive Golf Courses in our area: Huntsville Downs Golf Club Huntsville, Deerhurst Resort which features two distinctive 18-hole golf courses, and Bigwin Island voted the “Best New Canadian Golf Course” by Golf Digest – and the #6 Best Golf Course in Canada by Score Golf Ski or Snowboard at Hidden Valley Highlands Ski Area is just 7 minute drive away just off Hwy 60 Snowshoe and cross country ski on Walker Lake or many of the vast trails in the immediate area. Try tubing or skating at Arrowhead Park with your complimentary entrance pass : ) NEW TOUR OPTION! Upon request, we can arrange a variety of personalized on-site nature activities! Some of the educational nature hikes and tours you can choose from include: Wilderness Survival:Based on the ancient teachings of 'the Sacred Five,' we will explore the empowering ways to feel and live more 'at home' in the wilderness. or try a Tree Tour: Meet the majestic, green giants of the forest -- in this activity-enhanced walk learn trees significant role in the local ecosystem as well as their gifts to human culture as food, medicine & tools. In the context of the last glacial movement and learn how the local landscape tell the story of its past. We are only 6km away from J Albert Provincial Park with its majestic hiking trails to explore! Wifi now available NO CHARGE : ) We recently upgraded with our local provider in installing a cell booster to enable full use of your cell, laptop and tech devices! Vegetable cooking oil, salt, pepper, foil, saran also kept on hand. Blu-Ray Player :) with small library of popular movies. You are welcome to bring your own. 3 well known Golf Coarses, Deerhurst, Whispering Pines and Huntsville Downs, all within 10-15 km of Blue Heron, Full details available, just ask! The Blue Heron Cove is fully equipped with all the extras such as a new kitchen, waterfront tree house, hammock, UV filtered water system, garbage services, steam iron, Keurig and standard coffee makers, ample parking, Large Flatscreen TV, Blu Ray c/w Netflix,, complimentary movie library and includes on site garden chairs and a children's swing set. Additional Features: Upon request: a 4 man tent, portable playpen, carriage, crib available Complimentary Internet available, Optional maid Services are available and negotiated at reasonable local rates, boat launch access to lake: Note canoes, kayaks, paddleboards welcome! So glad we found this perfect little place. Susan is an awesome host and what other people say is correct. She is here if you need anything but other than that, you have complete privacy. It was very cold during our stay so we didn't venture out a lot, but we enjoyed the peace and quiet by the fire. Another great thing is that they are completely dog friendly. The place is very clean, and has everything you need (and more). We have already booked for a summer weekend so we can enjoy the dock, swimming, canoeing and some hiking. We highly recommend this place! Our family of four had a fantastic time relaxing by the water, swimming to the floating raft, playing in the 'treetop house', and riding bikes on the lawn. Fantastic hosts, and we'll definitely look at coming back again. My family and I were extremely happy with our stay at Blue Heron. From the moment we booked to our departure, the service was excellent. During our stay, we kept marveling at how everything we needed was right at our fingertips. Every possible need was considered from the availability of coffee, cooking supplies, personal items and equipment/supplies for our excursions to Algonquin. The home is beautiful and comfortable and we would consider returning as soon as we can. Thank you for your wonderful feedback! Blue Heron is all about guests like you creating life-long family memories. We are delighted that you enjoyed your stay and would love for you to be our guest again on your venture up to beautiful Muskoka ! We try to think of everything we enjoy while on vacation and we pass our experience along to all our guests to ensure a memorable stay. Take care for now and hope to see you again soon! Thank you Susan and Dennis for welcoming us on our 1st trip to Canada. Your premise was lovely, clean and had all the amenities for making our stay comfortable. The beach and dock are just steps away:) This is a great family-friendly vacation rental! It was such a pleasure meeting you and reading your positive feedback both in our guestbook and online. We are delighted you all enjoyed such a relaxing stay and had a chance to experience some our our beautiful beachfront sunsets in our new Muskoka chairs! Thanks again for staying with us, and please do think of us if your travels bring you back to Canada! My kids (17 and 13) and I had such a great little winter vacation and were able to pack so many activities in just 4 days with great savings thanks to the free Algonquin pass provided and being in such a great location. Snow shoes were available at the cottage so we could go snow shoeing around the lake which the cottage is on. Arrowhead park was just 15 mins away and we were provided with a free Algonquin pass that saved us the daily park/access fee per car. There, we did tubing, which was free, skating which was also free (for those that brought our own skates and skate rentals available for those that didn't), and cross-country skiing. There are also snow shoe trails at this park. It was so beautiful. Susan was so welcoming when we arrived. The place was clean, cozy and again some complimentary extra's that we really appreciated. The extra bedroom was used and we all slept great....warm blankets, clean rooms and comfortable beds. I can't say enough about our experience at Blue Heron's Cove but need to mention a very important extra that we've never experienced before which is how dog-friendly they were. No extra charge to bring our dog! ...and there were dog treats left for him too. I was in a pinch and was going to forego one additional activity we wanted to try (dog sledding) because we couldn't take or leave our dog but Susan offered to watch him for us! I knew our dog was in good hands with her and her family (which I also met both her son and daughter when we were checking out and all were very kind). We really hope to experience the cottage in the summer, spring and fall and hope we get the opportunity to. With so many great reviews I'll need to book early! Just over a two hour drive north of Toronto , Muskoka District,is a vast 2,500 square miles of stunning pine and maple forests, 1,600 sparkling lakes, magnificent waterfalls, granite cliffs, and the most breathtaking scenery in the province. Flanked on the north by Algonquin Provincial Park, Muskoka is known for its extraordinary beauty and tranquility. Many artists, sculptors, and writers are inspired by the magnificent and natural setting, lending the Muskoka area an artsy edge that further attracts visitors and cottagers. Muskoka is a year-round region. During the fall, Muskoka is transformed into an artist's palette of breathtaking colours. Winter offers an icy wonderland of fabulous snow activities including hiking, snowshoeing, skiing, skating, sledding, ice fishing, and more. With Spring comes the return of the mesmerizing calls of the loons, welcoming guests and all the exciting summer activities just around the corner. Most popular among our guests is Algonquin Art Centre, a world-class art gallery that showcases some of Canada’s foremost wilderness and wildlife artists. Located in one of Canada’s most beautiful provincial parks, the AAC is built upon a long tradition of artists in Algonquin Park from Tom Thomson to Michael Dumas. Feature lots of family art activities, art classes, art demos, to encourage our visitors to discover the artist within. Your complimentary pass gives you free entrance into the park. Voluntary admission. The Gallery Open June 1st to Thanksgiving Weekend. Huntsville Downs Golf Club is reasonably priced and built on 200 acres of beautiful Muskoka countryside, the par 72 - 6,270 yard Huntsville Downs provides the challenge and beauty of top rated courses without the high price tag. Deerhurst Resort in Muskoka, Ontario features two distinctive 18-hole golf courses, the famed Deerhurst Highlands and picturesque Deerhurst Lakeside, carved from Muskoka’s ruggedly beautiful landscape by acclaimed architects Robert Cupp and Thomas McBroom. Or Bigwin Island offers recently voted the “Best New Canadian Golf Course” by Golf Digest – and the #6 Best Golf Course in Canada by Score Golf. Hidden Valley Highlands Ski Area is the closest of many ski hills, just off Hwy 60 on Hidden Valley Rd in Huntsville, season and night passes are available, beginner, skiing and snowboarding packages. Cancellation Policy:You can book with assurance! Deposits can be applied to any future booking within 12 months. The owner will make every attempt to re‐book your reservation. If the reservation is re-booked at the same rate, you will be FULLY REFUNDED or prorated according to rebook price. We have had great success in rebooking as we offer last minute specials on behalf of our depositors!